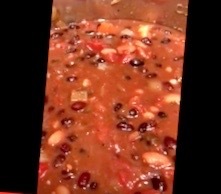 PURE & SIMPLE: BLACK BEAN CHILI IN THE INSTANT POT! VEGAN! Plant-based Protein, Minerals, Fiber & Micronutrients for a Glowing, Healthy Temple! COOK on IPs MANUAL Function for 19-20 minutes. Allow extra time for heating up and cool-down (about 45 mins). Release remaining steam after 10-15 minutes. NOTE: The silver button 'plug' is UP during the pressure cooking time, and recedes into the IP when it is safe to open the lid. CHANGE IP FUNCTION TO WARM MODE! YUM! Thank You for Your Prayers and Financial Support Dear Friends & Partners!